The banner of the Roman Catholics is well known. 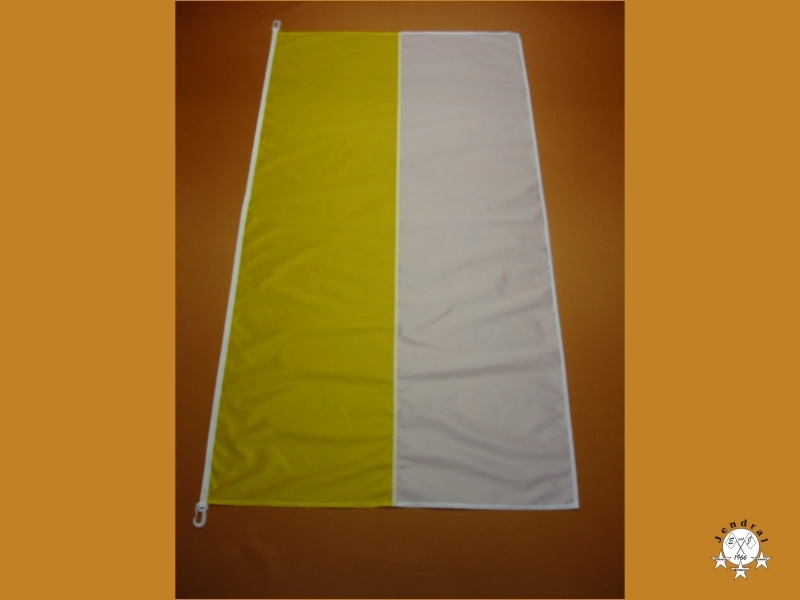 It is lengthwise divided by white and yellow. The centrally ruled Roman Catholic hoists this flag all over the world, the last time to be seen during the Pope's visit in Poland. I used to be a practising Catholic and I have never seen a similar flag; it could be a German creation for the visit of a pope or something similar, but the Catholic Church, as far as I know, has no flag (of course the Vatican City and the Holy See have a flag and coat of arms, but not the Church itself). I have found on the Vatican website news about Vessillo di Santa Romana Chiesa, in Italian; this one might be considered a sort of "flag of Roman Catholic Church", but is no longer used, as far as I know; other info could be found here: http://en.wikipedia.org/wiki/Gonfalone_of_the_Church - I think it is just an adapted translation of the Vatican page). In Italy during Corpus Christi and similar feasts a white flag with a red cross is sometimes used in processions; it is very similar to the famous Saint George's Cross. 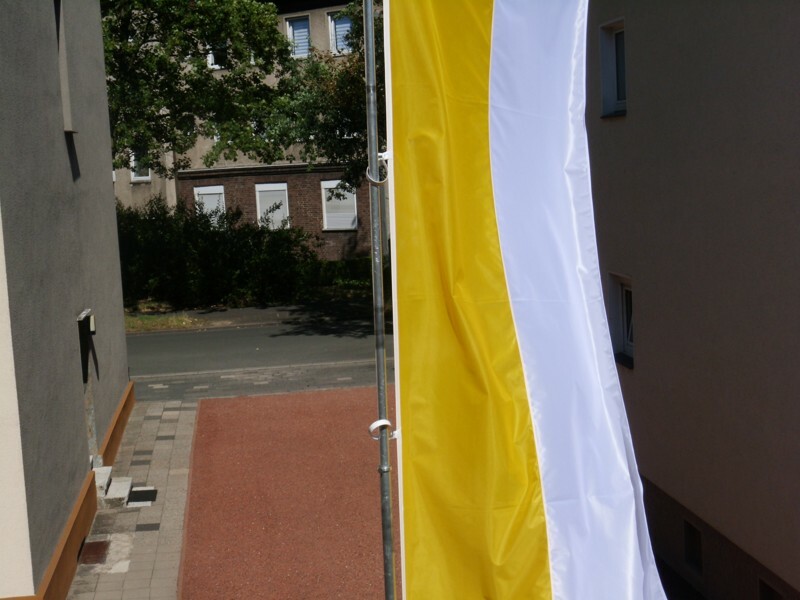 A photo of the flag, taken in Cologne, Germany on 2012-06-30, can be found at https://www.flickr.com/photos/taylormcconnell/7474622970. 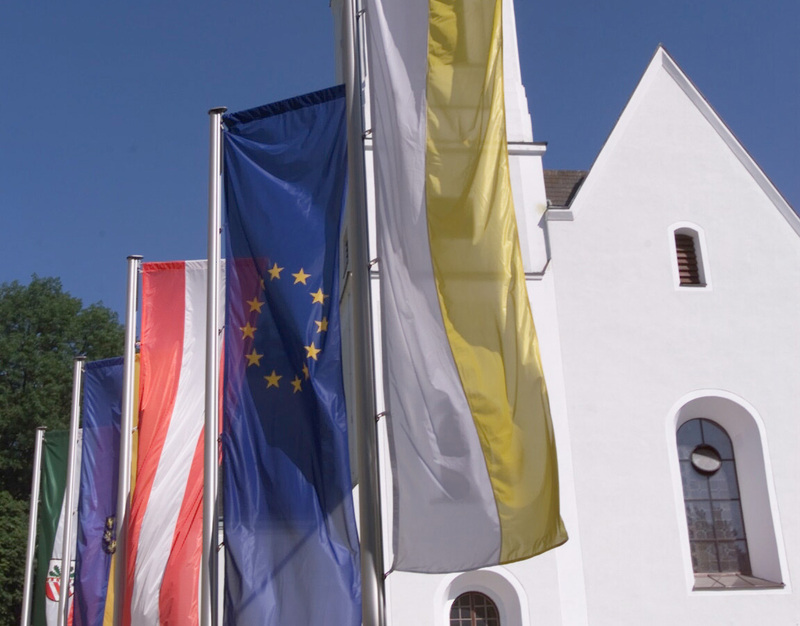 Note that gold is at the hoist, as in the flag of Vatican City, and that the form, with regard to the hoisting, is what is called Knatterflagge in German. This flag is usually flown outside Catholic churches. It has the same dimensions as the Vatican flag except it is blue and white. In the white portion there is a capital M with a Cross over it and these are surrounded by 12 stars. The M, Cross and stars are the same shade of blue as the other half of the flag. The image here shows the symbol on a medal. The Virgin Mary blue and white flag (without anything else) is used with the Vatican colours in Lourdes. I also saw it in Orléans during the festival of Joan of Arc. 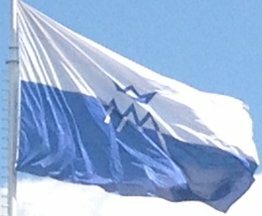 The Marian flag - a bicolour of white over blue, the colours associated with Mary in the Polish usage. I remember when I was in Poland as a child in 1974, I acquired a Polish flag, a yellow/white flag and a white/blue flag. At the turn of the last century, Polish immigrants in the US set up the "Polish National Catholic Church" - this church is a member of the group of churches known as "Old Catholic". The church has a website. From the US, the PNCC spread up to Canada and back to Poland - both before WWII and afterward, resulting in two separate groups there. I've been told that in Poland it is referred to as the "National Church", but in doing a bit of web searching this morning I found that one of the groups in Poland is using the name "Polish Catholic Church". The PNCC does not seem to have its own flag. The blue-white flag with the letters AM (Ave Maria) hoisted on Roosevelt Bvd. is to mark the annual pilgrimage to the Cathedral of Notre Dame (Octave). The flag for the Roman Catholic Church's Franciscan Custody of the Holy Land, flying outside the Custody's US headquarters, the Franciscan Monastery in Washington, DC. It is white with a red Jerusalem cross (a cross potent with a crusil in each angle). This design is attributed as the arms of the Crusader Kingdom of Jerusalem (but in yellow on white), and is used for the Papal Order of the Holy Sepulchre. The Franciscan friars working for the Custody wear the Jerusalem cross embroidered in red on the left breast of their brown robes. The symbolism is variously attributed to the five crosses representing the five wounds of Christ or to the message of the Gospel (the large cross) being carried to the four corners of the earth.